Turkey's imports of mobile phones stood at $2 billion in 2018, down from $2.8 billion in 2017. 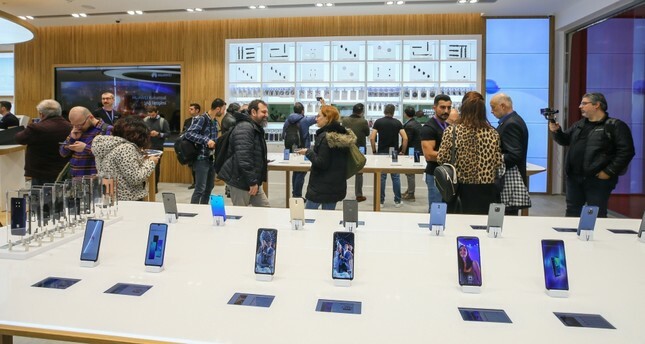 Turkey's mobile phone imports recorded a noteworthy decline in 2018, according to data from the Turkish Statistical Institute (TurkStat). The imports of mobile phones stood at $2 billion last year. In the five-year period covering 2014-2018, Turkey reached the highest figure in mobile phone imports in 2015 with 13.6 million units, amounting to $3.1 billion in revenue. In 2014, mobile imports stood at about $3 billion, while the sector saw $3.05 billion in 2016 and $2.8 billion later in 2017. Mobile phone imports dropped by 30 percent compared to the previous year. In 2018, some 9.8 million units were purchased, corresponding to around $2 billion. Meanwhile, the number of mobile phones imported in 2017 was recorded as 12.2 million. A total of 61.6 million units were purchased from abroad during the 2014-2018 period when mobile phone imports followed a fluctuating course. China, which has rapidly increased its industrial power with its recent investments, took the lead in Turkey's mobile phone imports, followed by other Far East countries, namely Vietnam, South Korea and Taiwan. Retaining its place in the mobile phone market with brands such as General Mobile, Vestel and Casper, Turkey reached $22.5 million in mobile phone exports in 2014, later achieving a five-year high in 2016 with $69.7 million. While in 2015, mobile phone exports were recorded as $30.7 million, this figure stood at $33 million last year, seeing a 10 percent drop compared to 2017. Having exported 504,022 units last year, Turkey sold a total of 2.9 million units abroad in the period of 2014-2018, generating $193.7 million in revenue. In this period, the Netherlands topped Turkey's mobile phone exports, followed by China, Vietnam and South Korea.